President Donald Trump and North Korea's Kim Jong Un will start their historic summit with a one-on-one session with translators. A U.S. official says Monday that the leaders will meet for up to two hours before an expanded bilateral meeting with their respective advisers. The official was not authorized to speak publicly about internal deliberations and insisted on anonymity. Officials remain uncertain what will come out of Tuesday's unprecedented summit, the first of its kind between a sitting U.S. president and the leader of North Korea. Trump has said he wants to strike a deal to get the North to give up its nuclear weapons. He also has sought to lower expectations for the meeting, saying it may be the start of a longer process. North Korea's official media have reported that leader Kim Jong Un is in Singapore to meet President Donald Trump to discuss how to forge a new relationship. The first word Kim is in Singapore for Tuesday's summit came early Monday morning. Though North Koreans have been left largely in the dark about the summit, the reports of his arrival came relatively quickly by North Korean standards. A dispatch by the state-run Korean Central News Agency says Kim and Trump will exchange "wide-ranging and profound views" on establishing a new relationship, the issue of building a "permanent and durable peace mechanism" and realizing the denuclearization of the Korean Peninsula. The report notes the summit is being held "under the great attention and expectation of the whole world." U.S. and North Korean officials are set to meet in Singapore to make final preparations for the summit between President Donald Trump and North Korean leader Kim Jong Un. White House press secretary Sarah Huckabee Sanders says the U.S. ambassador to the Philippines, who has taken the lead on policy negotiations with the North, will hold a working group with a North Korean delegation at 10 a.m. Monday local time, or 10 p.m. Sunday on the U.S. East Coast. Sanders says Trump spent his flight from Canada to Singapore "meeting with his staff, reading materials and preparing for his meetings in Singapore." Trump and Kim are set to meet at 9 a.m. Tuesday in Singapore, which is 9 p.m. Monday on the U.S. East Coast. The top Democrat on the Senate Foreign Relations Committee says the North Korean leader has already achieved some success just by bringing the American president to the table. Sen. Bob Menendez of New Jersey says: "To the extent that Kim Jong Un has already gone from international pariah to being normalized internationally, you have to say that he's had some success here." Menendez also stresses that getting a nuclear deal with North Korea will not be the hard point, noting that several previous presidents were able to strike deals only to see them fall apart. The test will be whether a deal has "verifiable elements of a denuclearization," to prove whether the North has dismantled its nuclear and ballistic missile programs. Menendez spoke Sunday on ABC's "This Week" as President Donald Trump arrived in Singapore ahead of Tuesday's talks with Kim. President Donald Trump has arrived in Singapore where he will meet with North Korea's leader Kim Jong Un. 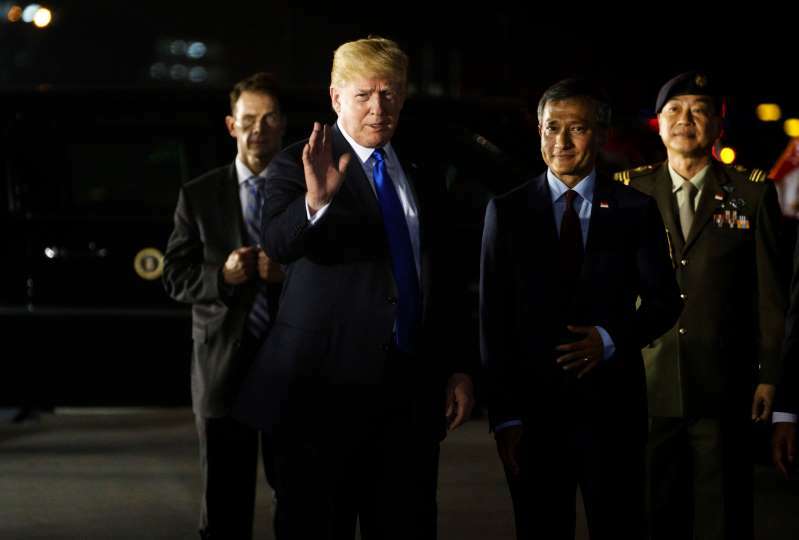 Trump landed at 8:21 Sunday evening at the island city-state's Paya Lebar Air Base, traveling from Canada, where he attended a meeting of the Group of Seven Nations. Trump's high-risk meeting with Kim is scheduled for 9 a.m. Tuesday, or 9 p.m. June 11 on the U.S. East Coast. The president hopes to win a legacy-making deal with the North to give up their nuclear weapons, though he has recently sought to manage expectations, saying that it may take more than one meeting. Francis expressed hope Sunday that Tuesday's talks between U.S. President Donald Trump and North Korea's leader Kim Jong Un in Singapore will "contribute to the development of a positive path that will assure a future of peace for the Korean Peninsula and the entire world." He invited the thousands of faithful in St. Peter's Square to pray with him so that the Virgin Mary "accompany these talks." Francis said he wanted yet again to send "a special thought in friendship and prayer" to the beloved Korean people. North Korean leader Kim Jong Un has met with Singapore Prime Minister Lee Hsien Loong ahead of Tuesday's summit with President Donald Trump. Kim told Lee: "The entire world is watching the historic summit between the DPRK and the United States of America, and thanks to your sincere efforts ... we were able to complete the preparation for the historic summit." A plane presumably carrying North Korean leader Kim Jong Un has arrived in Singapore ahead of Kim's summit Tuesday with President Donald Trump.